Fenugreek is a useful supplement to help your horse put on weight and regain condition, giving a new shine to the coat, Fenugreek aids digestion, helps in cough( expectorant effect) and problems of the upper respitatory tract, and stimulates the appetite. Fenugreek's chemical composition is very similar to that of cod liver oil. 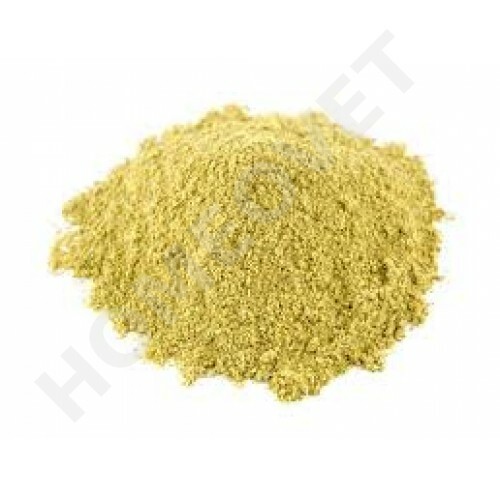 The fenugreek seeds are nutritious being 8% oil and 20% protein, containing vitamins A, B and C as well as Vitamin E, and rich in calcium, the seeds of fenugreek help in strengthening of horses in convalescence or underweight, it improves the general condition. The plant is used traditonally to promote milk production. In addition, calcium is especially important for lactating mares Fenugreek combines well with garlic and rosehips as a liver tonic, and can also assist with stomach comfort. Fenugreek can be used in geldings, mares and stallions but do not use in pregnant mares. Please note that the powdered form is much more efficiently absorbed than the whole seeds. Not suitable for pregnant mares!